I just made these and they came out absolutely delicious!!! Instead of doing the white and brown sugar though, I substituted it for 1 cup and about a tablespoon of Splenda. Theses came out soft and flavorful and where amazing. I didn’t have vanilla extract, so I used 1/4 t almond extract instead and they were SO good! Love that they are low fat but don’t even taste like it! These were WONDERFUL!!! I dropped them by the even measured tablespoon, and it made 38 cookies. I also used 1/2 cup of chocolate chips, and it was plenty! Next time I think I’ll cut back the white sugar a bit, but overall this was a fantastic recipe! Thanks! omg! i made a double batch of these cookies one weekend and they turned out awesome! so delicious! had friends over during the week and they didn’t even make it to the following weekend! thank you for the recipe! best cookies I’ve made by scratch, and I’ve tried millions of recipes. Except I didn’t have plain oats, so I used two packets of instant Maple & Brown sugar oatmeal and a cup of this low-fat brown sugar-sweetened granola cereal. I didn’t use any butter. Still, super delicious. I keep wanting to get more. My dad’s put off because I said they’re low-fat, and the fat-free brownies I made were awful, but these cookies are awesome. Can’t really tell the difference. 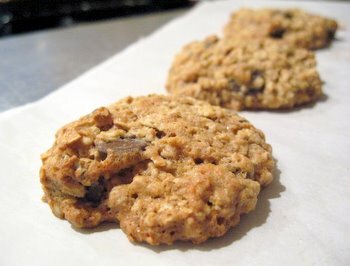 I love using applesauce as a fat substitute in baked goods – these cookies sound delicious. I’m going to make them tonight after dinner – thanks for a great recipe! Ever tried using whole wheat flour? Great taste, make some changes… half whole weat and half white flour…. less sugar…. in a double recipe i put one 1/2 cup white sugar, and 1 cup brown sugar and 1 and 1/2 chocolate chips. Will be making these tonight! Although I will replace the butter with 100% coconut oil, sub 1/2 of the flour for whole wheat flour, use raw sugar in place of the white sugar, and probably cut the sugar in half. I love cookies too much to cut them out completely, so the healthier, the better! Love these! I used all whole wheat flour and tried raisins in it on my 2nd batch. I used only 2 tsp of butter and they turned out great. Every one I share these with love them. They are easy to make too. Love the great taste. I substituted whole wheat pastry flour, splenda for the sugar and splenda brown sugar. Could not tell they were sugar free. Love it. Will make hundreds more! These are delicious! We always have chocolate and oats in the house, so I will be using this recipe often! Just finished making these (they are cooling on the rack as we speak!) I couldn’t resist trying one even though it was still hot and gooey, and they are delicious. Wow, thanks for the great recipe! These are great, and I even substituted regular oatmeal because I was out of the quick oats. This recipe is great! The cookies turned out really well. I gave them to my neighbors down the street. These cookies were pretty good! I also used 1/2 the sugar. Next time I will try 1/2 wheat flour and add some raisins. Do you think I even need to add the butter. Pulling out the 2nd batch, which I added chocolate chips, they are yummier! I also did not have parchment paper and sprayed once with Pam, no need to spray for next batches. I only had rolling oats. They came out nice. Thanks for the healthier version!! Cape Breton University » Blog Archive » Things!